The Rotary Club of Dover created this fabulous Holiday tree with our Rotarians for the Greater Dover Chamber of Commerce 9th Annual Festival of Trees. It was not only fun, but it was amazing to see our Rotarians come together over the past month to plan out the tree in methodical detail. 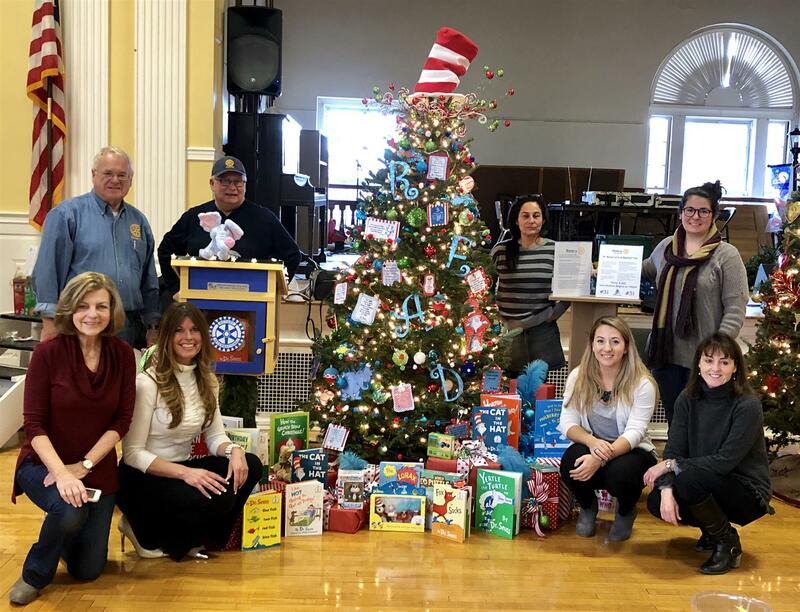 For the Rotary Literacy Dr. Seuss tree we gathered books, toys, ornaments, tree topper, tree skirt, and the Little Free Library. We worked hard to make this Holiday tree a tree that someone would auction on and enjoy. A beautiful Holiday tree. The Riverside Rest Home on Wednesday held a grand opening for its new gazebo. DOVER — The Rotary Club of Dover donated $15,000 to Community Action Partner-ship of Strafford County for its new HeadStart/Early Start playground and led a Rotary District Grant process that resulted in additional funding; $5,000 in a Rotary District Grant, a $2,000 donation from the Rochester Rotary Club and another $2,000 donation from the Durham/Great Bay Rotary Club. Thirty-nine students who completed the Seymour Osman Community Center Back-to-School Clothing Program were rewarded for their efforts with a gift card, backpack and school supplies sponsored by the Dover Rotary Club. The Rotary Club of Dover’s most recent donation through its Community Giving program was presented to HAVEN, a violence and support services agency serving individuals and families in the Greater Seacoast area. From their saddles, high above the gathered Rotarians, Mounted Patrol Officers Michelle Murch and Joe Caproni told the story of two amazing animals, their intense training, and the volunteers/donors who make this 20-year old program a staple in downtown Dover. Officer Murch noted the mounted patrol provides a positive police presence in Dover. They regularly visit homeless locations, checking for those who need extra help, offering many of the services available from the city. Officer Caproni said this was one of the hardest parts of their jobs - finding people who are not making good decisions. They do what they can. They also give out tickets while on patrol. The Rotary Club of Dover would like to thank Officers Murch and Caproni for taking the time out of the schedule to meet with us and explain what a great resource the Dover Mounted is to the community. A very nice letter to the editor from the Children's Museum of New Hampshire about a recent Rotary effort to construct raised planting beds in the Dover Adventure Playground. The Rotary Club of Dover donated $7,500 to the newly expanded Triangle Club, an addiction recovery support meeting place. The Rotary Club of Dover, New Hampshire meets every Wednesday at 12:15 at 121 Broadway in Dover. Visiting Rotarians, guests of Rotarians and future Rotarians are always welcome.